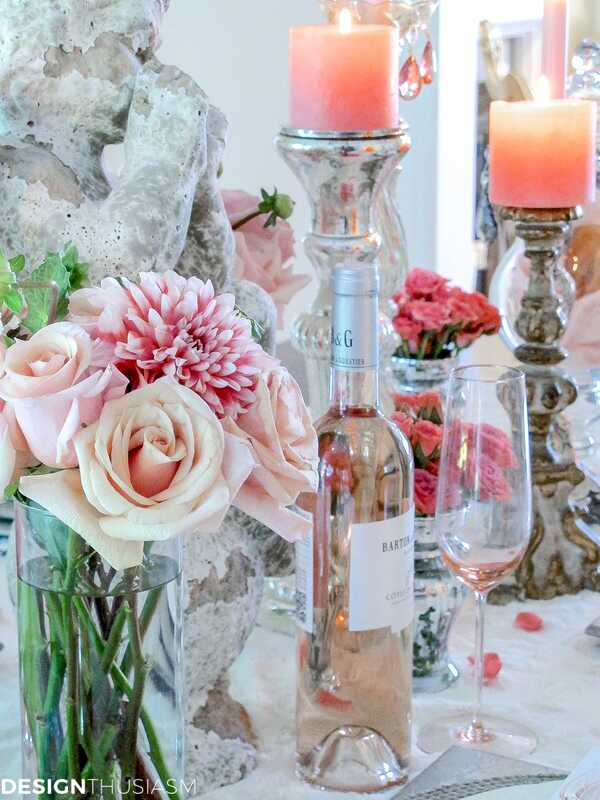 In this post: If you like chippy, romantic, feminine decor with lots of patina, why not set a beautiful table using unexpected shabby chic accessories? Does the term shabby chic make you cringe with thoughts of the 80’s? I must admit to sometimes falling into this trap, but the truth is yesterday’s shabby chic is today’s farmhouse decor. Chippy, weathered, romantic, and pale colors. But the extra note of bling is what makes it uniquely special to me and so in truth, shabby chic is a more accurate term for the look here. 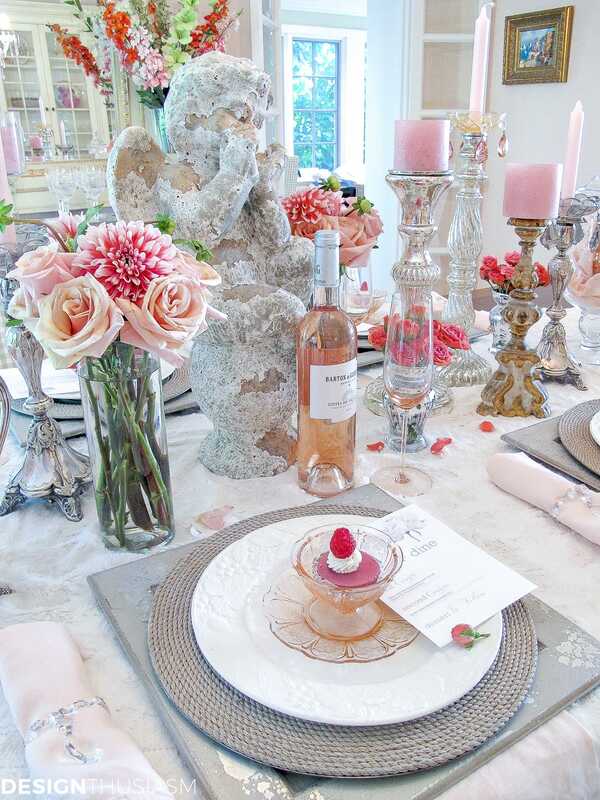 Decidedly feminine and perfect for a ladies’ luncheon, I’ve used shabby chic accessories to give personality to this chippy dinner party. It features layered round and square chargers in chippy-paint and rustic rope, balanced against a creamy faux fur throw and delicate blush linen napkins. 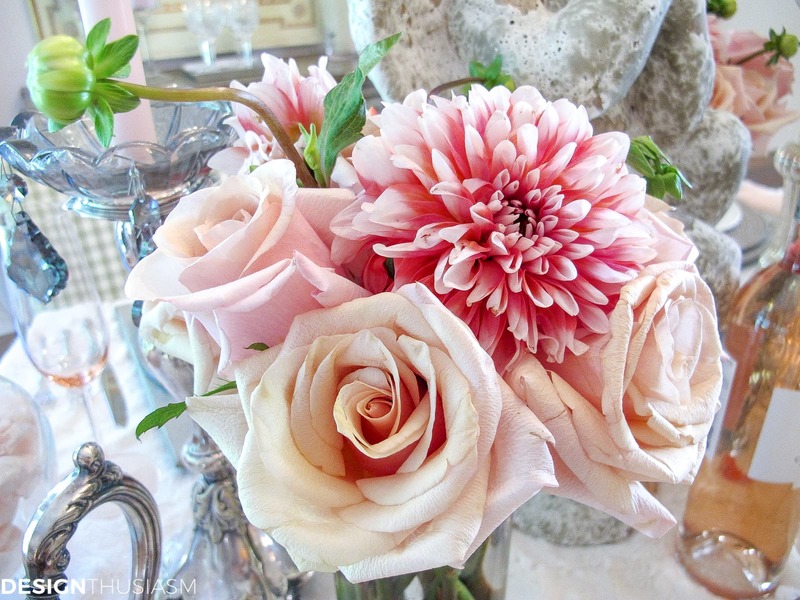 Gorgeous dahlias are mixed with soft pink roses and are scattered throughout the setting. 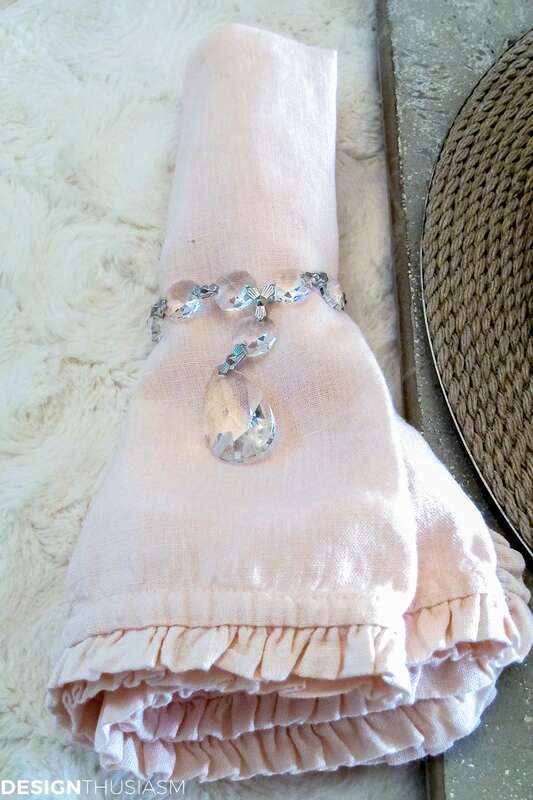 The ruffled napkins lend a casual sweetness, while the crystal napkin rings add a touch of elegance. The key to this look is the contrast between hard and soft, distressed wood and washed linen, set against glistening crystal and the lushness of the faux fur. The other prime chippy elements lining the center of the table are the garden statuary and the 18th century church candlestick, both offset by mercury glass and silver, glimmering in the early evening light. 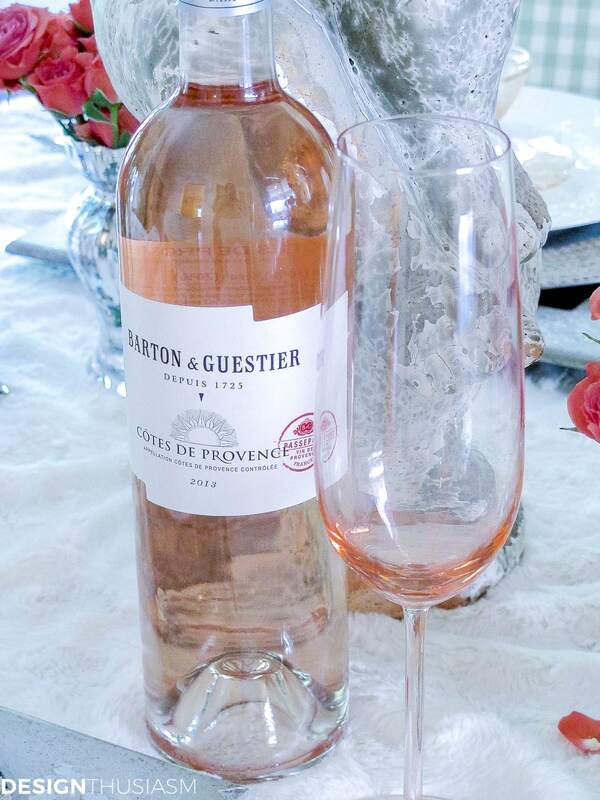 Blush pink flutes and rosé wine from Provence add warmth to the pretty tableau. 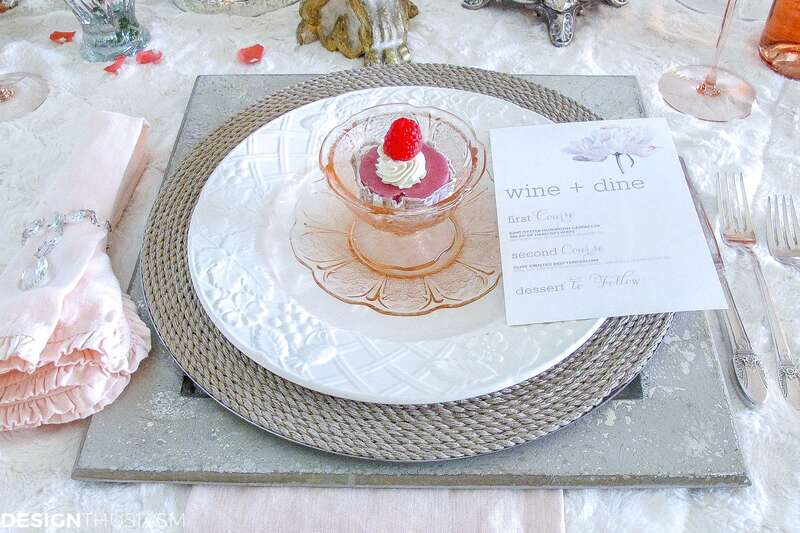 Creamy English Countryside plates serve as a lovely base for the depression glass dessert set. Vintage silver flatware is a family heirloom. The pink candles cast a rosy glow and help highlight the pink crystal bobeches. 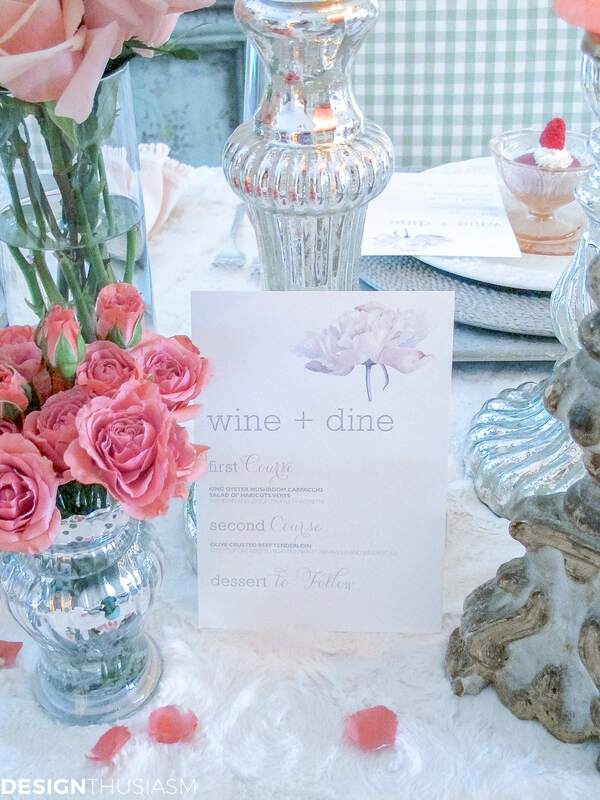 The DIY dinner menu features a pale pink peony and a playful mix of fonts. 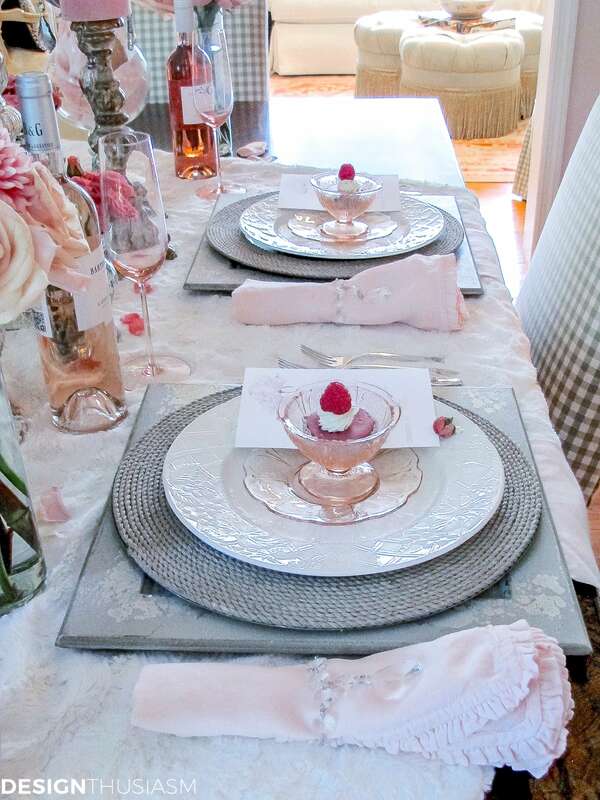 Tiny roses in a mid tone pink are mixed into the tablescape, as petals are sprinkled along the dinner table. 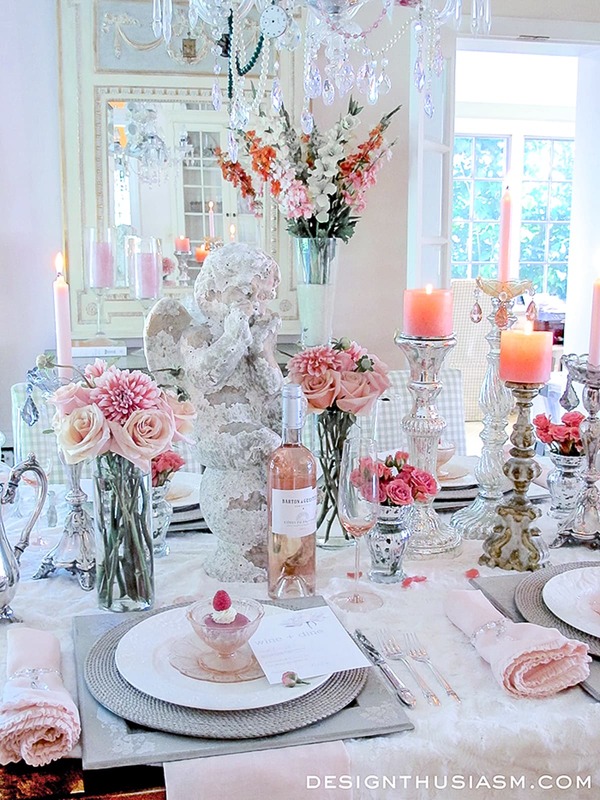 The wide view shows the complete setting, while pink candles are peppered throughout the room. 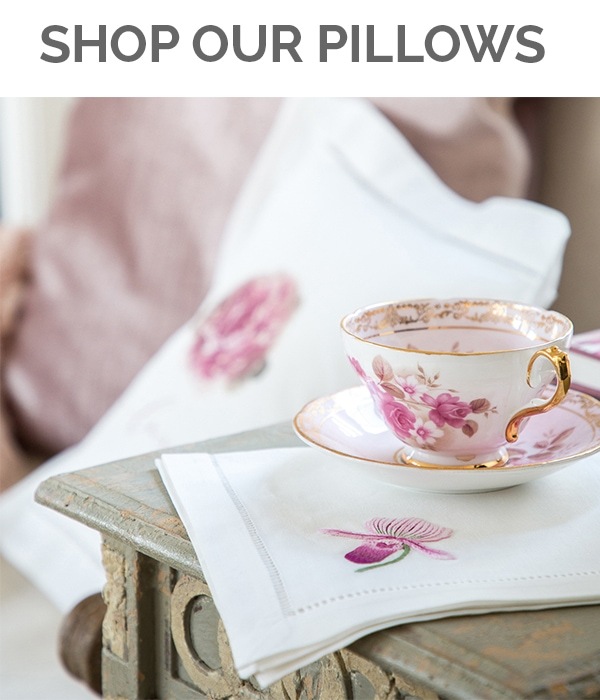 Shabby Chic Accessories Source List – To get the look, click on the items below for direct links to the products. Where actual items were no longer available, I’ve provided similar options. 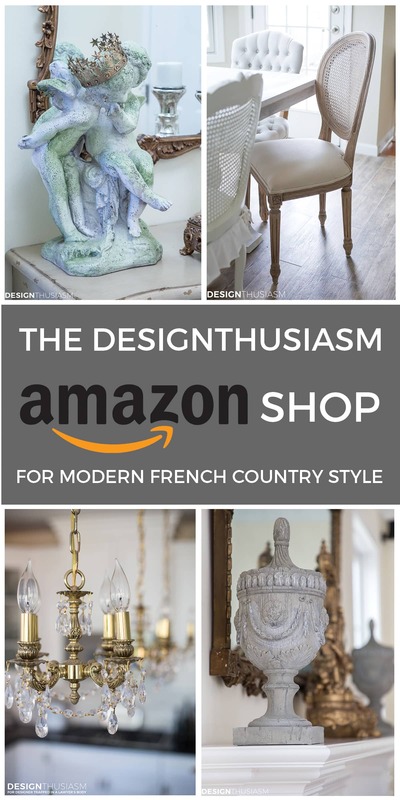 You can look here if you prefer the vintage dessert cups.~•~If you enjoy this style, you might love my Dough Bowl Centerpiece Tablescape or my 8 tips for Unique Table Decor Upgrades. Absolutely gorgeous table! Love the faux fur table topper. All of your elements look so beautiful together. 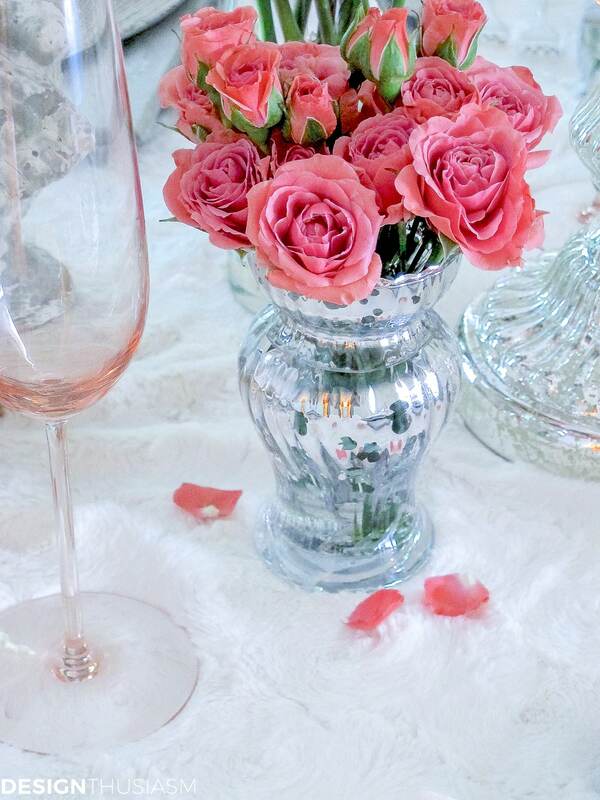 The softness of the table makes it so romantic. You are so generous doing this to benefit Breast cancer. I would love to see more fundraisers for ovarian cancer….The silent killer. I am fortunate enough to have survived this deadly cancer twice. I was actually thinking of doing that one next year – teal tables for charity… 🙂 Glad you beat it!! The setting is gorgeous and the colour of that Dhalia is so pretty. Dhalia’s in NZ are mainly bright ones, I haven’t seen one like this before. Your photos are all gorgeous. I have already done my voting. I hope you do well. It is a wonderful cause. Thanks Jenna! I think maybe the chippy greys ground the table so it doesn’t get too girly? I know what you mean about that. I’m glad to hear you donate on a regular basis too, so thanks right back at ya!! I am loving the soft peachy and pinks. 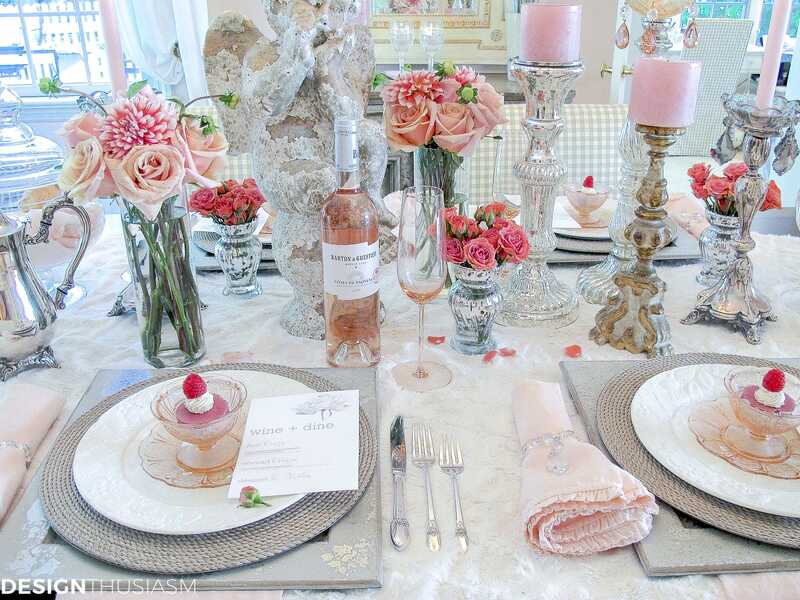 Your whole table setting is inviting and inspiring. I am so happy I stopped by. and lovely. So glad I came by to see it all. Your pictures are amazing………. Not just chippy. They are yummy too. Love all your treasures. The pastel is just adorable with the gorgeous angle. I already choose this as my favorite!! So romantic and pretty and inviting! i have a thing for pink and this is absolutely magnificent! i could stare at this pic all day! also loved what you did with your son’s apt! OH, this one has to be my favorite! I just love all of the chippy elements. Those napkins are TDF!!! I would love a set of those, so soft and feminine and the ruffle is fabulous. Your flowers are stunning too. This is just luscious pink! W-O-W!!! Beautiful pink setting! I’m a big pink lover, and this would be perfect for honoring a survivor or any special feminine occasion. The faux fur throw really sets it apart from the rest of the pack! Beautiful from end to end!!! So, so pretty!! 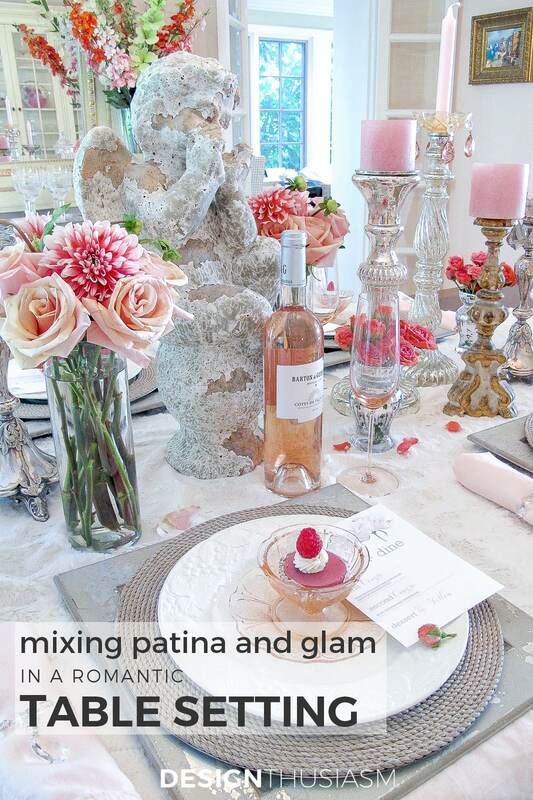 Love all of the pink, especially, the pink champagne flutes – just perfect for pink champagne!!! All of the different elements create an interesting contrast and keep the eye moving. Love it – happy Valentine’s Day!! Thank you so much, Diane! It’s funny – I’m such a pink girl at home, but generally dressed in head to toe black… lol! Thanks for visiting! Just beautiful…love those tall candlesticks. Your napkins and napkin rings are lovely! As lovely as this table is it would be hard to pick one to like better. What a great fund raising idea. OH please I don’t want to have to choose. I absolutely love everything about this tablescape. 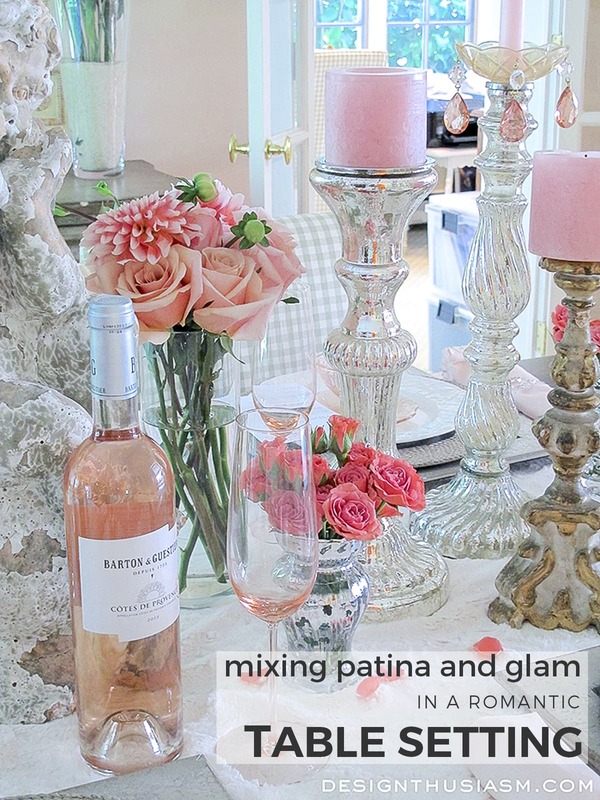 I love the pretty pale pinks and the mix of mercury glass. As gorgeous as everything else is, it’s the crystal napkin rings that have stolen the show for me. I am love with those. So pretty!!! Joining your from Tablescape Thursday. Thank you so much, Mary!! What a lovely comment… 🙂 Thanks for taking the time to tell me your thoughts! Here’s your rustic meets elegant table someone suggested in your interview with Hometalk! This table is exquisite to me! All the different elements work so well together. Definitely my favorite! Ha ha, great point, Martha! Someone’s paying attention!! 🙂 Thanks for the kind words too! What an absolutely gorgeous table!!! Breathtaking!!! A feast for the eyes!!! What a joy to create such beauty, right? !